« Obama will get a “secure BarackBerry.” Cost = $3,350. 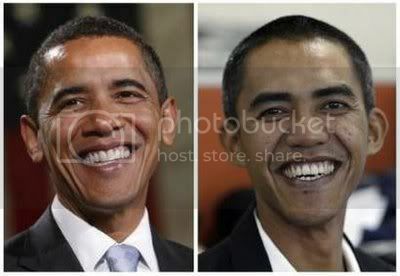 Does Obama have an identical twin brother in Jakarta, Indonesia? No, President Obama does not have an identical twin in Jakarta, Indonesia. However, “Indonesian photographer Ilham Anas” has recently become rich & famous because from “some angles [he] bears a resemblance to the new U.S. president.” I hope he does not move to Vegas and become an Obama impersonator. Thanks Tim for sending this info my way! This entry was posted on Saturday, January 24th, 2009 at 10:28 and is filed under Obama, Obama look-alikes, President Barack Obama. You can follow any responses to this entry through the RSS 2.0 feed. You can leave a response, or trackback from your own site.